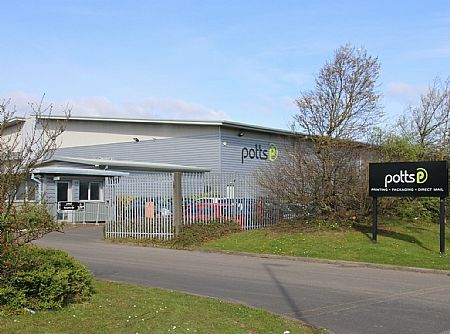 With a history that dates back to 1875, Potts Print (UK) has evolved through the years to become one of the UK's leading print, packaging and direct mail companies. The ability to deliver litho as well as personalised digital print solutions, along with bespoke packaging and direct mail, all with seamless production, storage and distribution services is the result of managerial foresight and a continuous investment strategy that sets the Cramlington Company apart from its competitors. 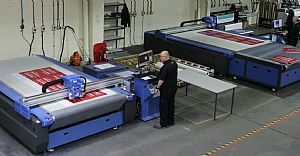 In 2015, Potts Print (UK) wanted an entry into large format print and acquired Digital XL Services, a long-term supplier that had the expertise, equipment and understanding of the large format sector. By integrating the Digital XL business into Potts Print, the Northumberland company is able to tap into the ever-expanding demand for large format work. Since its inception, Digital XL had steadily grown and invested in the necessary printing and cutting equipment to service its customers, but as soon as the company became part of Potts in December 2015the investment and growth truly took off. Potts has invested heavily in its large format division with the arrival of two FUJI Acuity F 3m by 2.5m large format flatbed digital UV printers. To support the expansion of the large format division the North East business needed to make sure its cutting equipment could keep pace with the substantially increased print capacity. Commenting upon this, Potts Print Director for the Large Format Division, Mr Keith McHugh says: "We already had a DYSS X7-2230C digital cutting table from AG/CAD, but our workload has increased a lot and become a mixture of volume production and small batch, fast turnaround work. It just wasn't feasible for just one cutter to handle all this work, despite us running a two-shift pattern. We needed another cutter and, based on the performance and reliability of the existing machine, another DYSS was the obvious step." Since Potts Print ventured into large format, the turnover of the large format division grown significantly. To support this remarkable growth, Mr McHugh wanted to upgrade the existing DYSS X7-2230C as well as bring in an additional machine. "Our existing X7 has been a great machine, but we wanted to upgrade to the latest K-CUT Vision system and KASEMAKE design suite to maximise the potential of the machine as well as streamline our processes. The AG/CAD team came on-site and completely refurbished the 8-year-old machine to an as-new condition with a host of modern upgrades. The AG/CAD engineers changed the PC controller, the software suite, added the latest K-CUT Vision system and camera, changed the machine conveyor transport, upgraded the cutting tooling and also improved the extraction system." "The 8-year-old machine was still performing very well and was extremely reliable, but like all equipment of that age, the option to upgrade components to enhance the machine needed to be weighed up. The X7 is an extremely well engineered and sturdy bit of kit, as we could see when it was being installed originally and during the refurb. This made the upgrade a very worthwhile exercise giving us clear productivity and efficiency advantages on a machine that we expect to see out another 10 years easily. An inferior build machine wouldn't have been worth us trying to upgrade." Alongside the upgraded 3m by 2.2m DYSS X7-2230C, Potts has now also installed a brand new DYSS X7-1630C machine. With one machine allocated to regular production runs from 1,000 to 5,000 and the other specified for low volume work as well as adding production capacity, the balance is now perfect for Potts. Mr McHugh comments: "As a business, we are committed to turning work out with a fast turnaround. Almost 70% of our large format work is on a 2-3 day lead time. This immediately eliminates the ability to design, manufacture and use cutting formes to diecut conventionally. We do have high volume production runs with a 1-2 week lead-time and we occasionally use cutting formes, but this depends upon what we already have going through on our two DYSS cutters." Why choose the Next Generation DYSS? Iain McDougal, the Head of Production at the Potts Large Format Division, together with Keith McHugh didn't just select another DYSS machine as a matter of course. The pair took pains to make an un-biased choice and re-visited all the available options for digital cutting machines. The new search for a cutter almost a decade after their first purchase revealed the same findings: that the DYSS was the most efficient, well built and cost-effective machine available. Mr McHugh adds: "The service and support from AG/CAD over 8 years has been impeccable; as has the reliability and uptime of the machine. We put the AG/CAD engineers to the test when we wanted our first machine upgraded. They delivered with unparalleled service levels and engineering excellence. All these factors were taken into account when we made our final decision." In addition to the familiar service and support network, the decision taken by Potts was also swayed by the compatibility of the new 1.6m by 3m DYSS X7-1630C and the KASEMAKE CAD software that was already in operation in the design department. "We knew the DYSS machine, the software, the support, and there was also the opportunity to utilise the commonality between the existing updated machine and the new one in terms of tool configuration and operation. So, when it came to taking delivery of the DYSS X7-1630C, AG/CAD could just drop the machine in and walk away. We didn't need training and there was no learning curve, so we hit the ground running." Like the previous machine, the latest DYSS X7 incorporates a SuperHead configuration that has 2 interchangeable tool slots accepting reciprocating and static heavy duty knife tools as well as creasing tools to enable folding of card media, etc. The SuperHead also comes with a high precision routing tool for milling tough sign and graphic materials that sits alongside the 2 tool slots. This flexibility enables Potts to handle everything from paper, vinyl, Correx (corrugated plastic) through to complete creasing and cutting of packaging and displays, to router cutting of more robust rigid materials such as acrylic, Dibond and thick Foamex PVC. Primarily operating on a B2B basis, Potts has ambitious growth plans for its large format division. Mr McHugh concludes: "As a business, Potts Print works with international corporations, retail and pharmaceutical companies as well as public sector customers. Production runs can now typically be in the thousands are printed on the flat-bed Fuji machines and then cut on the DYSS machines for immediate distribution." "The aim for Potts Print (UK) is to exploit the expertise and capability of the expanding division to offer value adding services for its existing customer base, as well as to attract new customers. This strategy is certainly working as business is booming."